I took Raven out for a walk late this afternoon, up the road a couple of kilometers and back again. It was a good walk and good exercise for both of us. In my case I’m hoping to offset my obsessive snacking that I seem to suffer from when I sit at my desk working for long periods. In Raven’s case I’m hoping just to wear off some of that puppyish energy (or is it border collie energy?). We were out for about an hour, and for most of it I was walking at a pace brisk enough to keep her at a good trot, and yet she still has energy to spare when we return home. This dog could go forever, I swear, she never seems to tire. On our way home I happened along this little snake lying on the dirt road. I almost didn’t notice it, and had nearly put my foot down next to it before I spotted it. It was little, about the size of a fully-grown Brown Snake, and boldly spotted. There are two possibilities for species, both being youngsters. One is Eastern Milksnake, but I’m fairly sure that it’s actually a young Black Rat Snake (Elaphe obsoleta), as young milksnakes are fairly bright in colour, usually reddish rather than brownish. 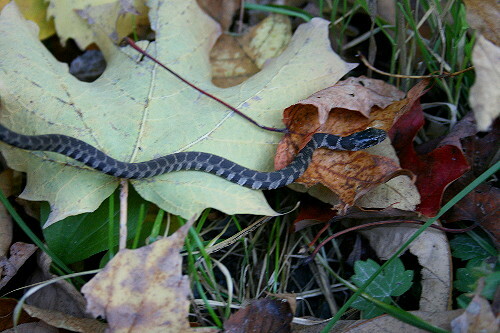 Found through much of eastern North America, rat snakes are at the northern edge of their range here in Ontario, and because of declining populations are now endangered in the province. They’re mostly found in just two small areas of the province, one down in the southwest, and the other here in the Frontenac Axis. This is only the second rat snake I’ve seen; the first was in the weeds beside the house on the day we signed the lease for it – a good omen, I thought. Edit: I’ve been corrected! This is actually a young Northern Water Snake, a possibility that didn’t even cross my mind at the time as it was some distance from the lake. This would make it also only the second water snake I’d seen, at least to that point. The info below is still for rat snakes, however. Adult snakes can get quite large, up to 8 feet (2.4m) long in extreme cases. They have the ability to climb trees because of special scales on their belly that curve upward where they meet the sides, providing better grip on surfaces. They are constrictors, squeezing and suffocating prey, and target primarily rodents, though they’re not opposed to opportunistically taking birds, bird eggs, frogs or lizards. 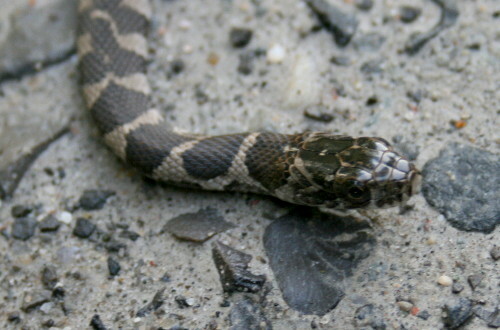 When startled or threatened, rat snakes will vibrate the tip of their tail in the dry leaf litter on the ground, creating a rattling sound similar to that of a rattlesnake. The snake found a scenic bed of fall leaves. It makes a snake want to hunker down for the winter, I would think? Gorgeous snake! Love the markings. We live in a parallel universe I think. It takes a stout heart (or a curious mind) to live out in the country certainly, Lavenderbay. I gather the owner’s 7-year-old son has the latter, so I hope he’s been able to continue poking around elsewhere and expanding his horizons. As much as I feel bad for him, though, I’m glad that we’ve moved in! Funny coincidence, Nina! You’ve got some great photos there, I’m envious of your backyard nests! Thanks for the correction, Nelson! I admit that water snake didn’t even cross my mind at the time, being some distance from the lake.